WITH HER country still convulsed by war and destruction, the visit to GIAF of Syrian architect Marwa Al-Sabouni, for a First Thought Talk, will surely prompt keen interest. Al-Sabouni, with her husband and two young children, has continued to live in her home city Homs throughout the war, even as much of it was destroyed in the conflict. Last year, her book The Battle For Home was published by Thames and Hudson. It distilled her observations and reflections on the way that architecture had helped create the conditions for the conflict that laid waste to much of Syria. From the country’s tolerant past, with churches and mosques built alongside one another, and members of different religions living harmoniously, the book chronicles the breakdown of social cohesion in Syria’s cities. The lack of shared public spaces intensified divisions within communities, while corrupt officials interfering in town planning for their own gain were symptomatic of wider abuses of power. Increasing ghetto-isation fanned the flames of sectarian hatred; as she said: "Losing the sense of belonging to a place and the sense of sharing it with someone else has made it a lot easier to destroy." Al-Sabouni also shared her ideas in an acclaimed TED talk last year and for her visit to GIAF, her presentation – entitled The Power of Home; Architecture, Geography and Conflict – will update and expand that TED address to reflect on recent developments in Syria and discuss topics raised in her book. “I never dreamed of becoming an architect when I was younger,” she tells me, speaking from Homs via Skype. As war raged through the streets of Homs how difficult was it for her, as a mother, to choose to stay? “The decision to stay came from me and my family - although my children are really young to decide on leaving,” she replies. “In our family we discussed this through a lot and we would like to think that we made the right decision for the four of us. It wasn’t the most difficult thing as a mother, but it has been a decision that was difficult but so many good things came out of it. 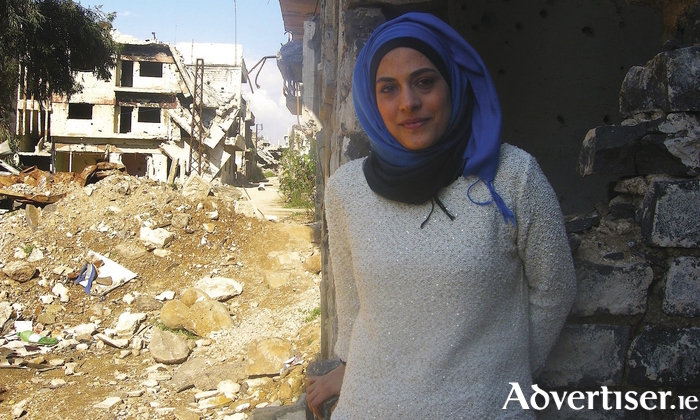 In 2014, Marwa won the Syria category of a UN Habitat Mass Housing Competition for a design she submitted for the rebuilding of a destroyed sector of Homs. She ruefully admits she sees little chance of the Syrian authorities taking up her ideas. “I’m not optimistic," she says. "Those proposals were for mass housing rehabilitation around the world not just in Syria but, as a Syrian architect, I chose a neighbourhood which was a social housing area that had been destroyed completely. For this particular neighbourhood, the government had issued another proposal. In the book you can see both my proposal and the official one. Those areas that you would call slums are here called ‘Informalities’ because they are not within the regulated city plans.